Finely chop 1 sprig of rosemary and cut the remaining sprigs in half. 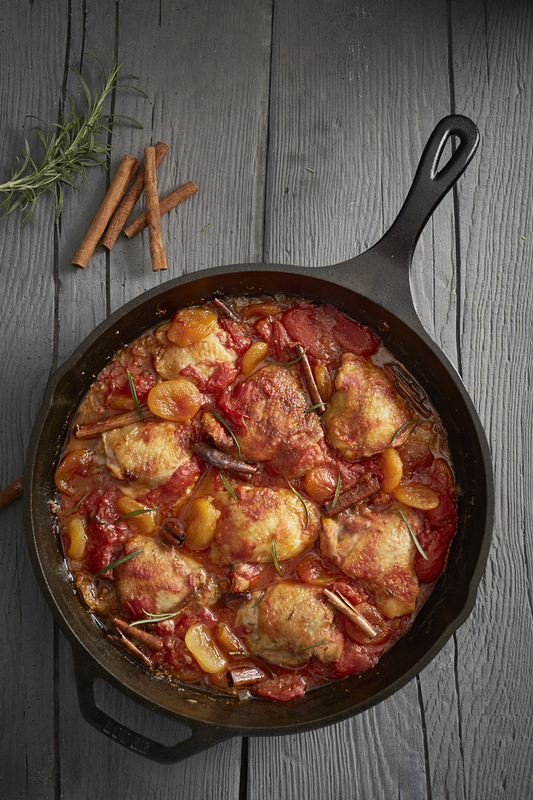 Heat a Dutch oven, or large cast-iron pan with a lid, on medium high. Add oil and butter, stirring until butter melts. Add the onion, chopped rosemary, ginger and chilies; stir cook until onions begin to soften. Stir in the garlic. Add the chicken thighs and brown on both sides (about 3-4 minutes per side). Place the apricots and remaining rosemary sprigs in between the chicken. Stir in the tomatoes, adding a little water if necessary to make sure the apricots and the bottom of the dish or pan are covered in liquid. Drizzle with the honey. Cover the pot, bring to a boil then transfer to the oven. Cook for 35-40 minutes, until the chicken reaches 170F. Remove from oven and let stand for 10 minutes. Remove cinnamon sticks and season to taste with salt and pepper. Shred the larger leaves of basil and leave the smaller ones intact, sprinkle over the chicken. Serve with couscous or rice.